Juventus boss Massimiliano Allegri believes Cristiano Ronaldo will benefit from the enforced rest incurred by his Champions League suspension. The 33-year-old's European debut for the club was wrecked by a red card for pulling Valencia defender Jeison Murillo's hair in a dramatic return to Spain two weeks ago. UEFA handed out a mandatory one-match ban, forcing Ronaldo - who impressed in the weekend win over Napoli - out of the Group H meeting with Young Boys on Tuesday. Paulo Dybala and Mario Mandzukic will instead be tasked with supplying the goals and could be joined in a front three by Federico Bernardeschi. "Cristiano needed to rest because he has played so many games," Allegri told a news conference. "On Saturday he played with great intensity, his best match since being here. "Dybala and Mandzukic will line up in attack tomorrow. Bernardeschi can play wide, inside or in the hole. I need to decide his involvement tomorrow. "We must win tomorrow otherwise we would undo the good work of the win against Valencia." @Cristiano Ronaldo made his group stage debut for @ManUtd. The Bianconeri will expect to secure three points against their unfancied Swiss opponents ahead of back-to-back dates with Manchester United. 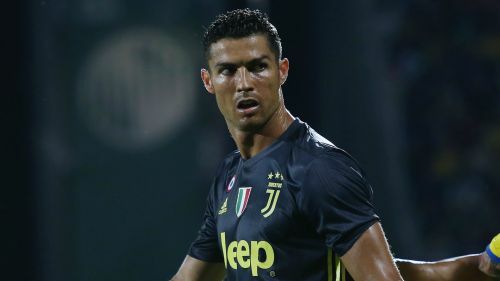 While Allegri is content not to have Ronaldo available, Young Boys boss Gerardo Seoane claimed he was disappointed the Champions League's all-time top scorer will be missing. "We're sad that Ronaldo won't be available as we always want to play against the best players," Seoane said. "From a football point of view it won't matter as Juventus will have other great champions playing tomorrow. It would have been nice to see him on the pitch, though." Veteran defender Andrea Barzagli will replace the rested Giorgio Chiellini in Juve's defence, with Sami Khedira to return from a muscle injury via the bench.